You gotta love it when things go just like you planned and you really have to love it when they go even better than planned. The one big thing I didn't have control over was the weather and it turned out that if I could have, I would not have been able to plan for it to be more perfect than what we had on race morning. Woke up at 4am and followed my usual pre-race routine and then made the 45 minute drive to Cary to meet up with Ultra Angel, Mountain Girl, Marathon Princess and Mr Minimalist, aka Jenn, Lisa, Karla and Frank, to shuttle over to the race starting area. The temperature was a near perfect 44F and calm, ideal for racing. About 20 minutes before the start, Lisa and I ran a warm-up mile and then made our way to the starting corral. Although there were over 2,000 starters hardly anyone was near the front so I lined up near there behind 1:30 pace group although I was aiming for 1:45. Due to issues with buses bring runners from the satellite parking area we had a 15 minute delay to get started. Finally we got the command to start and I used my experience of over 300 races to stay calm and go out at a relaxed pace. the first three miles of the race are on roads leading to the American Tobacco Trail. We have trained on the course a few times as well as my running the full marathon last year so a big part of my plan was to use my knowledge of the course to maximize my pacing strategy. I knew the first mile had a few small hills and as always it's good not too go out too fast. To run my goal of 1:45 I would need to average 8:00 per mile pace so I was very pleased to hit the first mile spit in exactly 8:00. Ultraman, the human metronome ! Mile 2 has quite of bit of nice downhill so I hoped to use gravity to an advantage and get a little time cushion without having to increase the effort. By now I was warmed up and everything was feeling good. Legs had some zip and breathing was controlled and relaxed the energy level was great. hit mile 2 in 7:31 and it felt easy. Sweet! The main reason I wanted to run mile 2 well was because mile 3 is mostly a gradual uphill. As soon as the climbing began I eased off the pace and relaxed enough to make sure I maintained an easy effort and not worry about the time. Once again the plan was perfect as I passed mile 3 in 8:03 for a total time so far of 23:34. As we turned on to the trail I knew that the next mile over to White Oak had an ever so slight incline so I was going to just relax, make sure I was completely recovered from the hill and not worry about pace yet. Went through mile 4 in 8:13,a little slower than I liked but I knew that for the next couple of miles there is a slight decline so I worked my way around the congestion of runners slowing at the water stop and kicked the pace up a notch. Fell into a nice groove and when I passed mile 5 in 7:46 I was already feeling very confident that I was going to make my goal and so I just put it on cruise control. The next couple of miles were just awesome. what a wonderful feeling to be moving at a slightly faster pace than needed and it seems almost effortless. Days like this are pretty rare and I was really enjoying the day. Mile 6 was 7:49, and then mile 7 was a quick 7:35. In the next mile the trail would once again begin a slight incline so i was careful to back off the effort just a little bit. Even slowing down I went through mile 8 in 7:53, still adding a little to my time cushion which now was over a minute. Just a little further and we made a u-turn and headed back in the other direction. I hadn't gone too far when I saw Lisa a few minutes behind me . she looked strong and I estimate that she was close to her pr pace. I was still just cruising along and enjoying looking for other friends coming towards me. Hadn't gone far when I saw Ultramarathon Mom Amy running with Gary and the 2:00 pace group. She was a last minute entry but her training with me is paying off and she looked strong and relaxed. After awhile I was worrying because I hadn't seen a 9 mile mark. a glance down at my watch showed over 11 minutes since my last split so I knew I either missed it or there wasn't one. the course was on a little incline again and I could feel the effort now but hoping I wasn't slowing down. Finally went by the 10 mile mark and couldn't help but smile to see that I had ran the past two miles in 15:32, a 7:45 pace. Oh yeah ! Just past that mark the course turns off of the trail and onto roads for the last 5k. There are a couple of small hills and now I was feeling like I was racing instead of just cruising along. I could have easily backed off and coasted it in with a time under my goal but that is not in my nature. This is a RACE and if I've got anything I'm going to use it. Mile 11 was an 8:08 but then I knew the next two were predominately flat or downhill so I pushed it up a notch again and was able to drop it back down to 7:50 for mile 12. There's one very short but at this point a nasty little hill in the last mile but after that it is smooth sailing to the finish. hit mile 13 in 7:55, then made the turn and ran the last .1 strong. 1:43:03 ! Woohoo ! 2 minutes under my goal time and if I had known I was going to be that close I could have found another 4 seconds to go under 1:43. I quickly made my way through the finish chute and grabbed my camera and ran back to look for Lisa. She was right on schedule and got a new PR, but the battery was dead in my camera so I missed the shot. We had plenty of time before Frank and Karla would be in so we went to put on some warm clothes since it was still in the low 50's and the wind had picked up. After awhile we went back to look for Karla. She ran well considering the foot injury and lack of training and look relaxed and smiling as she finished. A few minutes later Frank was done. We spent some time hanging out and visiting with so many of our friends that were there. That's a great thing about these local races. I can't remember how many times I heard people cheering for me at so many places along the course but it was inspiring and greatly appreciated. Thank you all for your support ! 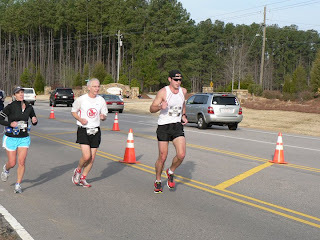 And thanks to John Tate for taking the picture above just before the 12 mile mark. After awhile i took Lisa and the Werners back to their car and then return to wait and watch Jenn finish the full marathon. Sat around with Amy and Charles until it was about time for her. She didn't run as well as she would have liked but as always she ran well and looked great. That sounds like a nice build up race at Tobacco. I hope we have good weather in Hopkinton on the 18th.